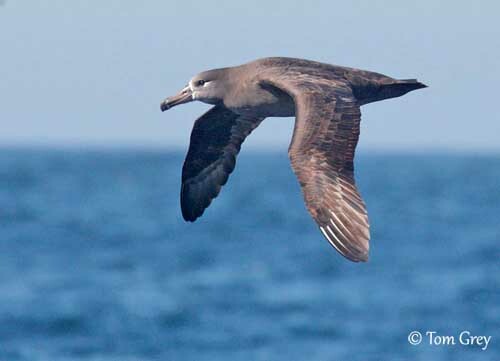 The habitat of the Black-footed Albatross is the open ocean in the Northern Hemisphere. It spends some months on breeding islands before to return to the sea. 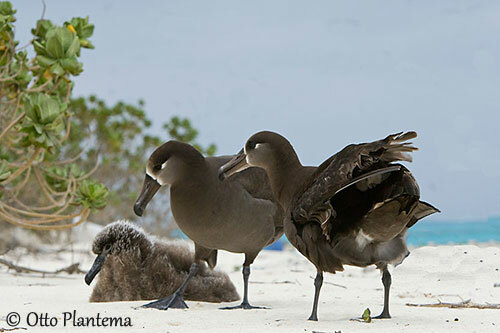 The Black-footed Albatross is small compared to other members of this family. It has dark brown plumage and usually white uppertail-coverts. The underparts may be paler than above. On the head, we can see variable extent of white or pinkish-grey or even pale brown below the eye and around the bill base, extending up towards the crown. The bill is blackish to dark brown with black tip. The eyes are brown. Legs and webbed feet are blackish. The juvenile has more uniform brown plumage. 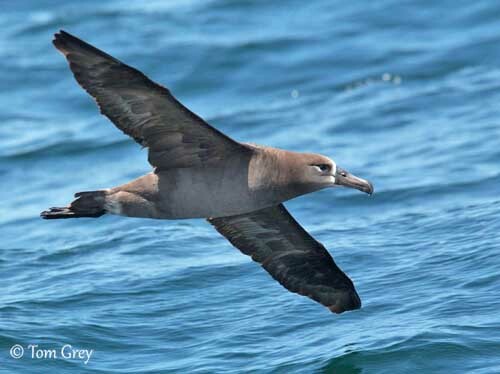 The Black-footed Albatross is usually silent at sea, but it may produce several croaking and gurgling sounds when they are feeding from fishing boats and competing for the food. During the breeding period on land, some grunts, throaty cries and moans often accompany the displays. We can hear a characteristic rattling sound when the birds perform bill-clattering repeatedly. 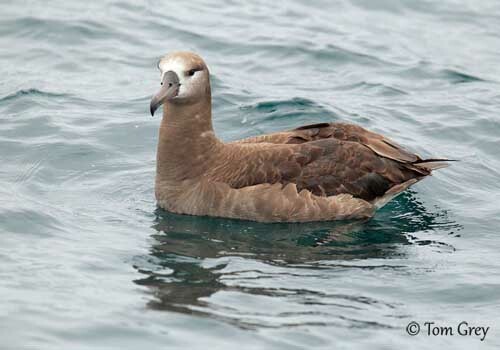 The Black-footed Albatross is found in W Hawaii. They range in the Northern Pacific. 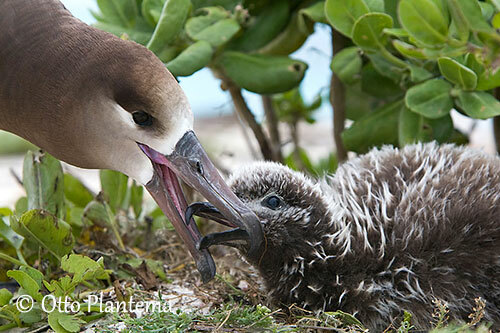 They breed in colonies on isolated islands of the NW Hawaiian Islands. 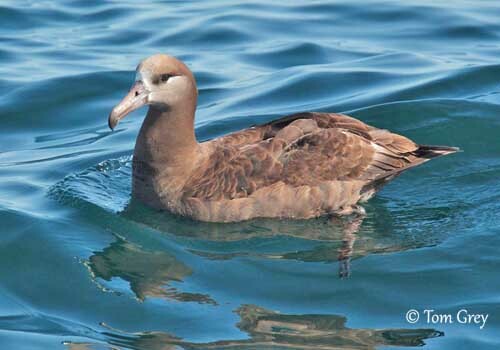 The Black-footed Albatross feeds on fish and offal from fishing boats. It also takes squid and crustaceans and consumes floating debris. It picks food items from the surface and may also dive from the air. They often follow the fishing boats and other ships along California current. 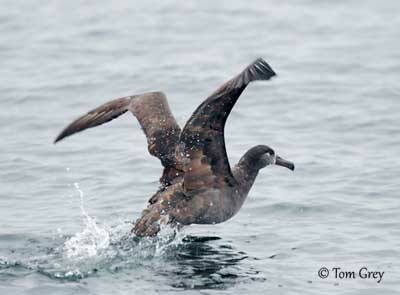 The Black-footed Albatross disperses over the Northern Pacific after the breeding season, and often reaches the Bering Sea. Large numbers occur off Pacific coast of N America. This species may reach Galapagos Islands and New Zealand. 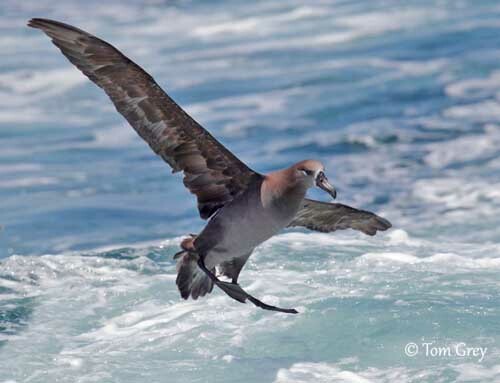 The Black-footed Albatross needs to cover long-distances when foraging. The large wingspan makes difficult both taking off and landing. The bird needs to run over the surface to take flight, and landing is something hazardous. The flight is highly efficient in the strong winds. The bird turns into the wind to gain height and then, it glides while losing height gradually. It repeats the same method several times. But it cannot sustain flapping flight and remain on the water when there is no wind at all. The breeding season starts in November. 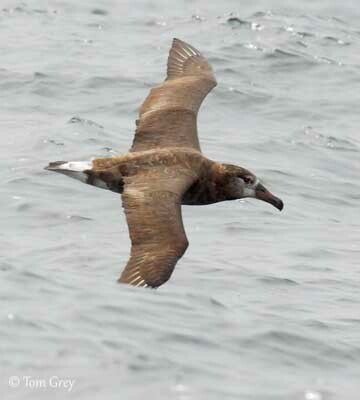 The Black-footed Albatross nests in colonies, often associated with other seabirds. The simple nest is a scrape in sand, with no rim, made with pieces of grasses and located near beaches. The female lays a single egg. Incubation by both parents lasts about 65 days. Male and female incubate alternatively during two or three weeks. The chick is covered in greyish-brown down becoming paler very soon. It is fed by both adults by regurgitation of squid oil and flying fish eggs. It fledges 4-5 months after hatching, in June/July. Both parents usually leave the breeding grounds before the chick has reached the full juvenile plumage. The young bird relies on its fat reserves until its first flight. It reaches the sexual maturity at 8/10 years. The Black-footed Albatross is listed as Endangered, due to habitat loss, disturbances and predation by mammals on the breeding grounds. Some local increases due to conservation management may lead to a review of this categorisation. The birds ingest great quantities of floating rubbish across N pacific from Japan. The Black-footed Albatross is marine and pelagic, and breeds on islands, on beaches and slopes with bare ground or little vegetation. 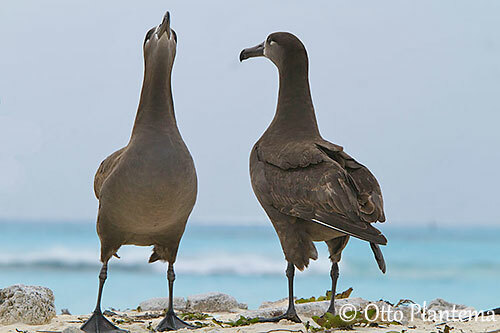 The Black-footed Albatross pairs for life. At the beginning of the breeding season, the pair defends the nest-site, performing bill-snapping at intruders and fighting, sometimes strongly. 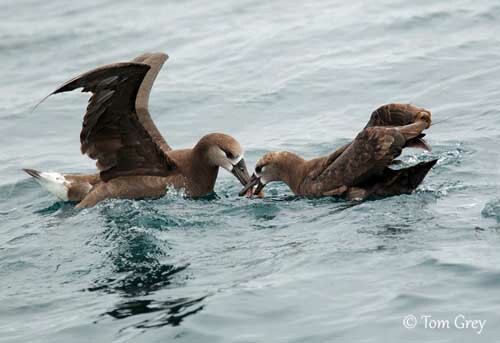 Albatrosses have a wide repertoire of courtship displays such as long sequences of ritualized and stereotyped postures repeated over and over again. They perform bill-circling, sky-pointing, and flank-touching with the bill. They move close to each other while opening the wings, performing a communal dance. 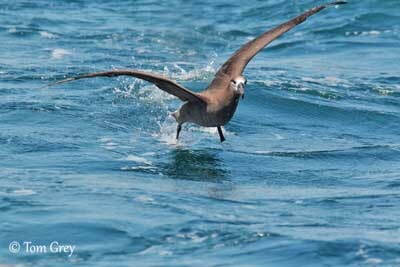 The Black-footed Albatross feeds mainly on fish and fish offal, but it also takes squid and crustaceans.